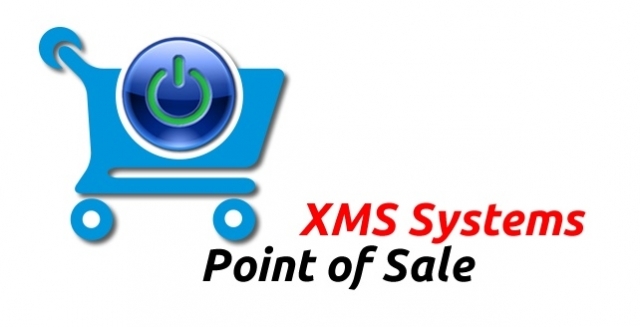 The huge success of the XMS E-Commerce system that integrated 100% with the rest of XMS Systems and associated products has let to the natural extention and developement of the XMS POS Module. 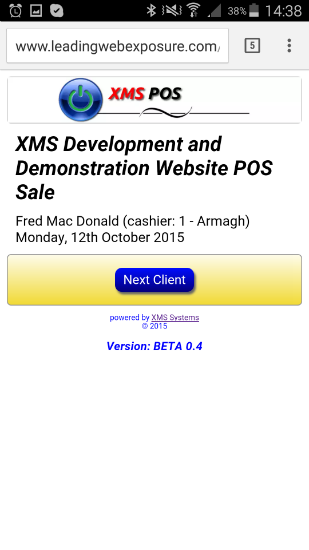 XMS POS does not replace the XMS E-Commerce module but integrates closely with it. 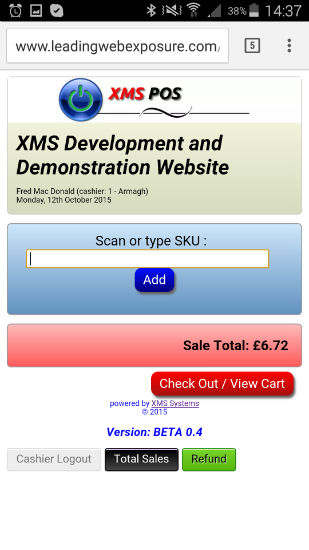 Enhancing XMS E-Commerce to the point where your website can be used in your shop or street market to sell and manage your stock levels. 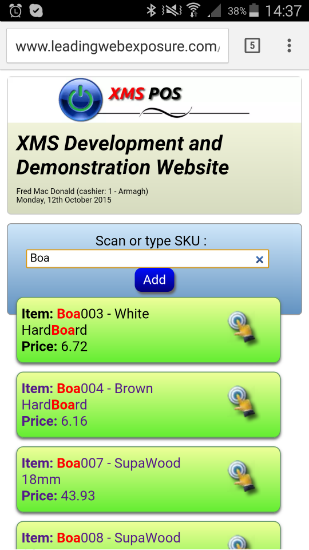 The userface of XMS POS supports any 2D barcode scanner to quickly and accurately scan bar codes generated by XMS POS as well as allows for manual automatic searching of products by simple typing the SKU or product name into the SKU field. 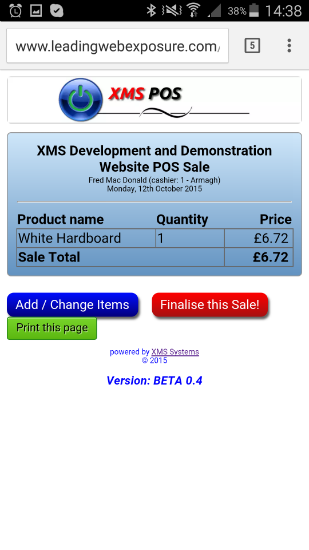 In the most basic configuration, XMS POS uses the exact same products as what you already use for XMS E-Commerce with the difference that you can define any product to be available to the XMS POS system only. 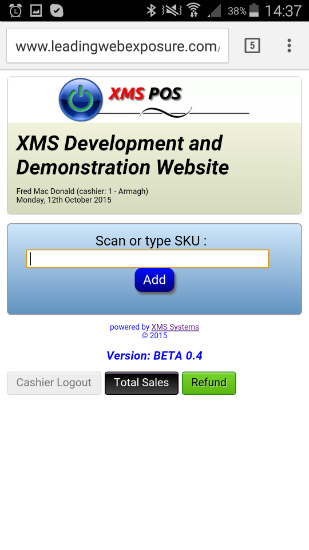 Pricing and currency are set seperately from XMS E-Commerce and any number of cashiers can be allocated to a multiple "locations". Location being the location of your shop or market stall. Supporting different currencies you can easily setup different locations in different countries and manage your stock from a central location. Stock Take reports per location. Detailed summary and drilldown reports per stock item, date period, location, per weekday, month name, week number and year. 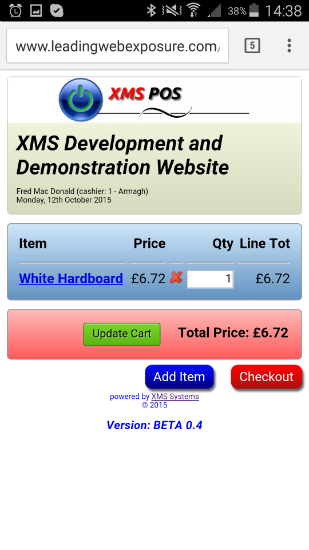 First you need to setup your stock item as usual in your XMS E-Commerce section. Define a location that you going to sell at. Define your cashiers making sure they have at least a level 11, or lower security (access) setting in their member profile page. Assign the stock items that are available at this location, setting the prices that you want to sell at. Make sure the cashiers that are going to use XMS POS in the specific location is set to "active"
At any time during the day you can monitor the sales per cashier. At the end of day print the daily report and do the "End Of Day" run to clear the daily sales database and adjust your stock levels with what have been sold. If required print the re-order report and replenish your stock according to the report. 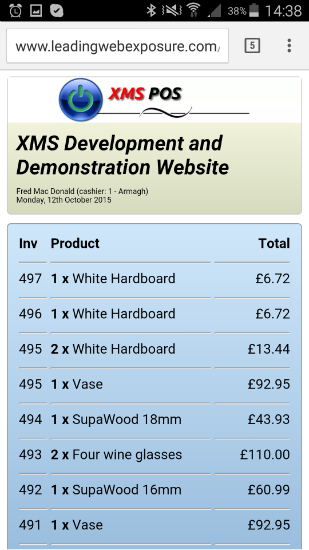 The UI is a minimalistic design to ensure fast loading for virtually any netword speed and adjust seemlessly for any screenwidth making it an ideal platform to use on your mobile device when selling from a market stall.